After years of going big on hybrids and investing in hydrogen fuel cell vehicles, Japanese automakers Toyota and Honda seem to finally be waking up to the idea of fully electric battery-powered vehicles. Now the latter is debuting an all-electric Honda Clarity soon, which will join the Clarity fuel cell car and hybrid. So how much range will this fabulous Honda EV have? Something to match the Chevrolet Bolt’s 238 mile range, or the predicted 215 miles (at least) of the upcoming Tesla Model 3, or even the new Hyundai Ioniq’s 124 miles? The shortfall is not a failure of its engineering, Honda says, but the unavoidable result of its choices. The automaker defined two parameters that were nonnegotiable: the physical size of the Clarity platform — which the EV shares with the Clarity plug-in hybrid and hydrogen fuel cell models — and the cost of the battery-electric version, which is expected to start around $35,000 before any tax credits or incentives (pricing hasn’t been announced). 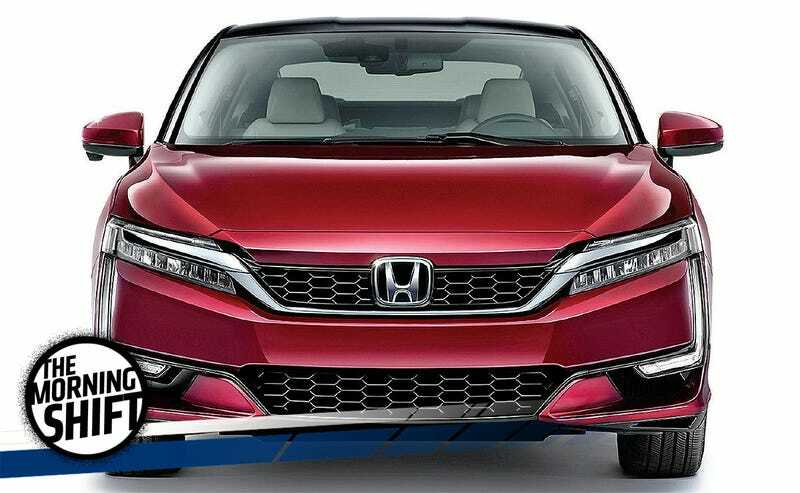 With those hard points, Honda didn’t leave itself any leeway to fit a longer-range battery, which would have been heavier and costlier. True, but I’d argue that small segment is an awfully competitive one, and and while the Clarity EV will secure some Honda loyalists in California who need a good city car, it’s hardly going to serve the needs of most American drivers with that range. I guess it’s a start? Elaine Chao, the Trump administration’s new Transportation Secretary, seems cautiously optimistic about autonomous cars, but according to Reuters she seeks to urge companies to “explain the benefits of automated vehicles to a skeptical public.” She’s right. Traffic fatalities are up, people aren’t getting better at driving, and all this technology is useless is people can’t understand why it exists or how to use it. In 2015, 35,092 people died in U.S. traffic crashes, up 7 percent and the highest full-year increase since 1966. In the first nine months of 2016, fatalities were up 8 percent. Additionally, Chao expressed concerns about the 3.5 million jobs potentially at stake in the trucking industry and other driving-related occupations. She is right to be concerned about that as well. No official policies have been put forth yet, but such tariffs could make your next new car quite a bit more expensive if it was not produced in the U.S.—and that doesn’t even account for foreign parts sourcing. 4th Gear: Would Americans Buy The Mercedes X-Class? Mercedes-Benz is getting a midsize pickup called the X-Class based on a Nissan truck platform. We Americans won’t get it. Or we might! Automotive News reports Mercedes is mulling the idea, given how lucrative the segment can be—but also how competitive it is. “In the past year, the midsized truck market has come back a bit. General Motors is launching a midsized truck. We are watching developments very closely, and we will take a decision at the appropriate time,” Mercedes-Benz Vans boss Volker Mornhinweg said. The X class is built for Mercedes-Benz by Nissan Motor Co. in Spain. It is based on the Nissan NP300 Navara and Renault Alaskan. Mornhinweg said a U.S. production site for the pickup was also under consideration. If the X class is green-lighted for the U.S., by the time it finds its way to U.S. dealerships it is likely to find the competition much stiffer than today. Sales in the midsize pickup segment have grown 83 percent since its recent nadir in 2013 of 244,834 units, with much of the rebound coming from GM’s redesigned Chevrolet Colorado/GMC Canyon. Last year, the GM twins accounted for about a third of the segment’s 448,398 sales, but continued to trail the long-running Toyota Tacoma, which has held the segment crown since 2005. The Tacoma took half of the segment’s sales in 2015, and 43 percent in 2014. Company representatives are scheduled to be in U.S. District Court in Detroit Monday afternoon. The company agreed last month to plead guilty to one count of wire fraud. Three executives also have been indicted on charges that they falsified test reports. Takata inflators can explode with too much force, spewing shrapnel into drivers and passengers. At least 16 people have been killed worldwide and more than 180 have been hurt. Neutral: Will People Buy The Honda EV? It’s clearly not the world-killer the Model 3 and Bolt aim to be, but is it enough for now?